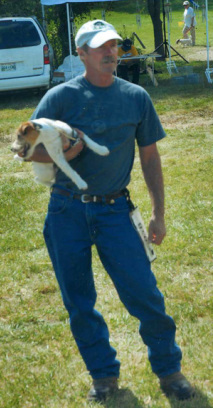 Lisa and Tom Cronin have been breeding Jack Russell Terriers since﻿ 1987 as members of the Jack Russel Terrier Club of America and the Yankee Jack Russell Terrier Network. All dogs at Still Meadow are registered with the Jack Russell Terrier Club of America and have pedigrees back four generations. Pedigree papers are provided for all puppies. All puppies will be Bear tested (at an additional cost), PLL Clear by descent, and SCA clear by decent. They will have their first shots, vet certification and worming prior to leaving Still Meadows. Stud certifications are available upon request. We are happy to answer any of your questions concerning pedigrees or history of any of our dogs. To see more photos of our past puppies, visit our photo gallery! Welcome New additions to the Still Meadow Jack Team! We are looking for great things from these girls in the future!